My favorite flower is the white rose. Why? Hmm. Because maybe it's the first I ever received? Or, simply because it's so dainty, pure and just beautiful. I was given a bouquet of white roses as peace offering from a close friend. There was a rift between us. I was lied to which had fumed me and i distanced myself. But just after a short while, I was in a classroom (College Days) and I was told that there was someone looking for me. I went out and found my friend standing outside with a bouquet of white roses, then my heart melted. 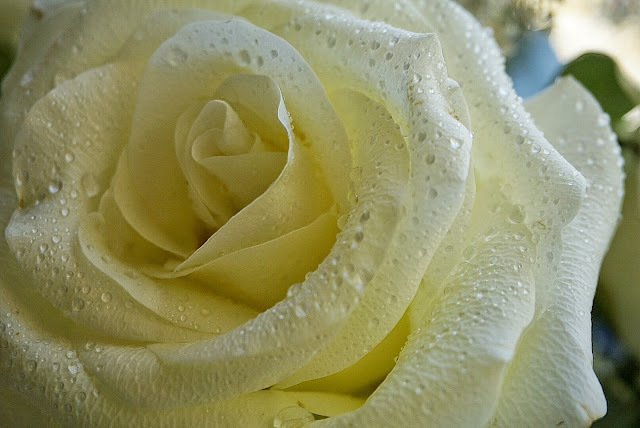 According to flower enthusiasts, a white rose symbolizes new beginnings, spirituality and marriage. Also, giving roses with this color gestures remembrance. My friend may or may have not known the meaning behind the color of the rose given to me but indeed it patched us up and from then on nothing even petty quarrels have gone our way. I was a new beginning for our friendship.